-A collection of best selling Lavender products in a sheer purple bag. This bag also comes embellished with a card with facts about Lavender. 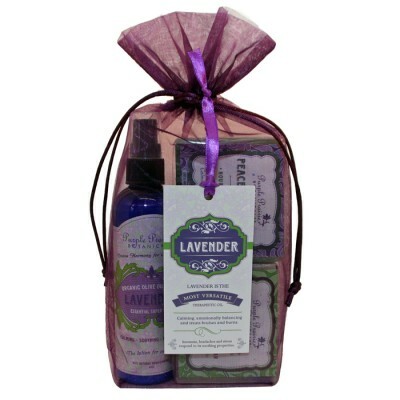 What a great gift for Lavender lovers on your list! Lavender is the most versatile of all the essential oils. Lavender is calming and emotionally balancing. Its antibacterial, painkilling properties treat cuts, colds, bruises and burns. Insomnia, headaches & stress respond to its soothing properties. Peaceful Prairie Soap Bar 4 oz. Lavender Soap Bar 4 oz.